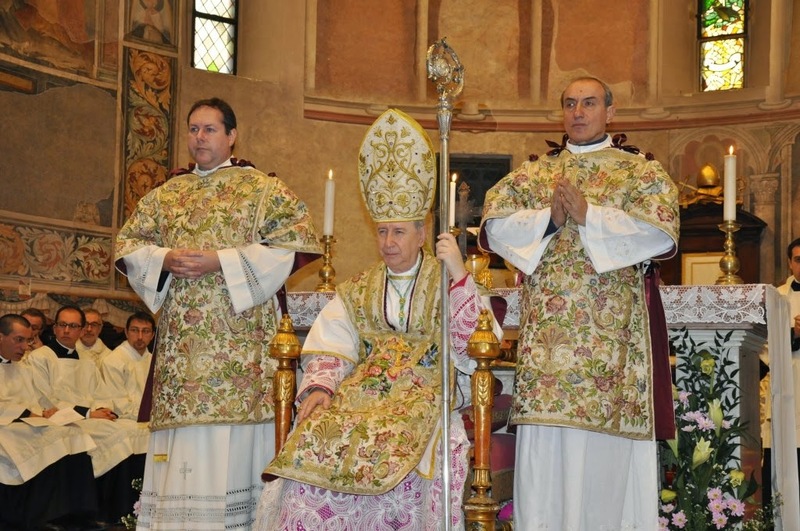 Among the Italian bishops, Bishop Oliveri is extraordinary for his friendliness to the Traditional Latin Mass, leading Messa in Latino to proclaim the Diocese of Albenga-Imperia as "Number one in Italy for pastoral attention to Tradition!" Aside from publicly celebrating the Traditional Mass a number of times, he wrote a stern pastoral letter in 2012 ordering his priests to implement the motu proprio Summorum Pontificum faithfully. (The full text can be found on Messa in Latino.) Rorate wrote about him in 2009: An Oasis for the 1962 Missal in Italy. He welcomed to his diocese the "Benedictines of the Immaculate", characterized by their strict adherence to the 1962 Missal. And despite the smallness of his diocese it had no less than 3 friaries of the Franciscans of the Immaculate (we will come back to this later). He also stood out in the Italian episcopate for his theological support for Tradition, being the author of the preface for Msgr. Brunero Gherardini's The Ecumenical Vatican Council II: A Much-Needed Discussion, and of various articles that, while accepting Vatican II, insisted that its documents be interpreted as closely as possible to the pre-Conciliar Magisterium. He also publicly praised the groundbreaking book Iota Unum of Romano Amerio. (Interestingly, Msgr. Oliveri once worked at the Apostolic Nunciature in Dakar, when the memory of Archbishop Lefebvre was still very strong there.) Last but not least, Msgr. Oliveri stood tall among his peers for his outspoken support for the Italian pro-life movement. Because of his reputation, the little diocese of Albenga-Imperia, along the coast of Liguria, near the French border, has long been known in Italian Catholic circles as a refuge for conservative and traditional-leaning seminarians and priests from all over Italy, and even beyond. Naturally, in the course of 24 years and in the context of the tremendous decline in vocations all over the West, the diocese would end up attracting (and accepting) not just sincere and holy vocations, but questionable ones as well. Which leads us to the media storm that has been forming over Bishop Oliveri over the past few years (so much so that Albenga-Imperia has been called in the Italian media, "the most gossiped-about diocese in Italy"), and which has now intensified with the news, widely reported since two days ago, and again yesterday, on the Italian media, that Pope Francis will soon be appointing an auxiliary or coadjutor bishop with the quality of a "commissioner" with the task of all but replacing Oliveri as the true governor of the diocese, leaving him bishop of the diocese in name only. Italian media reports (such as this and this) confirm that the ostensible reason for the intervention is that Msgr. Oliveri has been too merciful in accepting morally-tainted and questionable seminarians and priests into his diocese, some of whom ended up committing sexual offenses and crimes. Some clergy of the diocese are also accused of stealing Church money. There is no question that there have been a number of "bad apples" and "black sheep" among the clergy of Albenga-Imperia during Oliveri's very long tenure; a small number have been accused of abusing minors male and female, while accusations of homosexuality and deviant behavior (from courting married women to posting naked pictures of themselves in public) have been leveled against some priests. What made things worse, in the eyes of the bishop's critics, is that these offenses were made by clergy who were not native to the diocese, but who were there only because they had been accepted by Bishop Oliveri after having been rejected for a variety of reasons in their home dioceses or countries. These facts, though distressing in themselves, are unfortunately common throughout the sorry landscape of the post-Conciliar church in Italy - so, by themselves, and especially since the diocese has never refused to investigate them when they came up, there would be no justification for an intervention, and Oliveri never raised any of the investigated to positions of authority. The bishop himself is not accused of any wrongdoing, but is reported to have been overly-charitable in recruiting “black sheep” priests with distinctly chequered pasts, including trainee priests (sic) expelled from seminaries for misconduct. Then why is Bishop Oliveri being singled out for punishment among hundreds, if not thousands, of prelates who have been as guilty (if not more so) of the same lack of discernment for which he is now about to be humiliated by the Vatican? Now, scandalous behavior by priests and seminarians ought always and everywhere to be rejected and strongly condemned; but what strikes us when reading the charge sheets leveled against Oliveri on the secular media is just how common these actually are; how many dioceses, how many countries, are free of homosexual or philandering priests and seminarians? How many bishops, how many dioceses, how many religious orders and congregations have accepted questionable vocations? And is not Santa Marta (Domus Sanctae Marthae) in the Vatican, the Pope's own residence, itself run by a prelate guilty of highly deviant sexual behavior, who was also placed by the pope in charge of overlooking the Vatican Bank (IOR), and whose only claim to international renown was getting stuck in an elevator with his Swiss officer "rent boy"? A look at the articles published against Oliveri by the Italian secular media is quite revealing. It is obvious that the real problem is something else entirely than just scattered accusations of having "homo-friendly" priests in his diocese (which would simply make him an average Italian bishop, whose dioceses invariably are the set of atrocious accusations every single week)! Also because, if this did not happen, behold that from the Vatican could arrive the counter-move: the closing of the Albenga seminary, officially because it is anachronistic, but in reality because it is a hotbed of model and ultra-traditionalist priests, by now unwanted not only by the faithful, but also by the ecclesiastical hierarchy, on both sides of the Tiber. At the far west [of Italy], at the helm of the diocese of Albenga-Imperia, Mario Oliveri, 70 (and 46 of priesthood) is considered the champion of traditionalism: in his diocese, are greatly welcomed even young priests, such as the pastor of Laigueglia, don Danilo Galliani, who moved back the altar to where it was before the Council, and who, at the moment of Communion, always reminds [the faithful] that "according to the current norms", Communion may be received also kneeling at the communion rail. "Traditionalist, me? 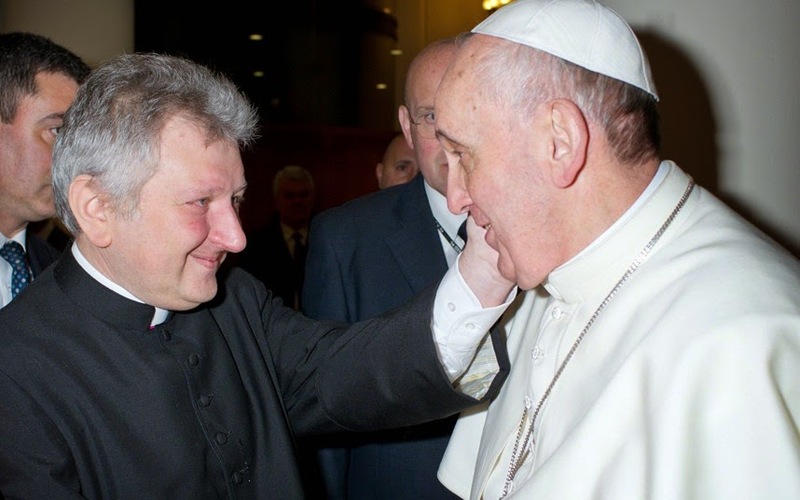 I wasn't aware of it," he answers to those who ask him if he feels he is the standard-bearer of a wing of the Church who lived their greatest moment with Ratzinger, trying to find their place today, at times with great difficulty. Traditionalists hope that from him may come the opposition to a move forward by the Synod. Material worldliness and spiritual worldliness: two faces of the same coin, pride. Another myth of the ideologists of traditionalism has fallen. Also Bp. Oliveri, as Fr. Stefano Manelli, professes great faith in the Virgin and in the Vetus Ordo Latin Mass, but, this is not enough to obtain the gift of infallibility, nor to [receive] confirmation in grace. And it is not an accident that the bishop of Imperia had made himself available to welcome the rebels who flourished in the Institute of the Franciscans of the Immaculate who do not wish to obey the decisions of the Pope. Which brings us to an act of Bishop Oliveri that may have precipitated his fall. In reality, it is payback regarding a local bishop who has dared defend and support the demand by an FI priest for permission to remain celebrating Holy Mass in the extraordinary form for the faithful who go to it regularly; rather we should say now, who "went to it"! Perhaps this doomed Msgr. Oliveri to the blacklist reserved for bishops who have been supportive of traditional-minded elements in the FI? P.S. Why on earth is the Secretary of the Pontifical Commission Ecclesia Dei insisting that the Vatican indeed wants an agreement with the Society of Saint Pius X (FSSPX / SSPX - see this interview, in French). If those merely accused of "Lefebvrism" are treated by the new Vatican authorities like cow dung, how are the real "Lefebvrists" going to be treated? And the SSPX is certainly not ignorant of what is being done to Msgr. Oliveri: La Porte Latine has an article on the matter.